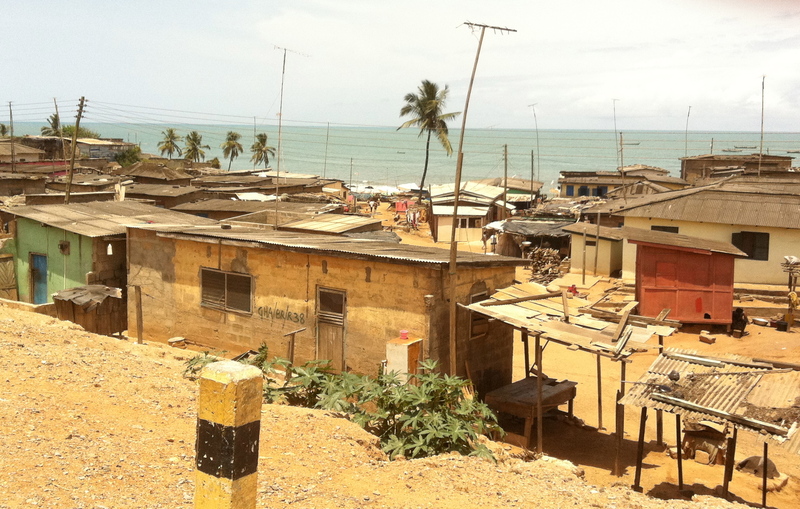 Did you know Ghana’s pre-independence name was the Gold Coast? This catchy moniker has been copied around the world, but none compares to the original. Named not for gold bikini clad meter maids (like Australia’s gold coast), but by the Europeans who were stunned at the amount of gold that came from this part of the Gulf of Guinea. Indeed, the gold is the reason that we are here. Over the Easter break, with 2 other families, we made the 7 hour journey from Kumasi, down to the Cape Coast, and across to Axim Beach. When we first moved to Ghana a South African friend gave me a sage piece of advice, which always makes me smile. Remember, you are never alone in Africa. Think you can nip into the bush for a quick toilet stop unnoticed…think again! But, despite it being Easter Thursday, this was the view that greeted us. The surf was so rough, had we been in our seaside home of Newcastle (Australia) we wouldn’t have braved the waves; but desperate for the soothing touch of the ocean, we all jumped in. And stayed in, for hours. Come Easter Friday, the hotel had filled up, and the beach was busier, but it never reached a bustling sea of humanity we have grown used to, like Kejetia Markets; or Bondi Beach on a Sunday in summer. The hotel is situated on a small peninsula, and the accomodation are fetching cottages with thatched roofs. While the rooms were simple, the verandah was wide, and the view was divine. 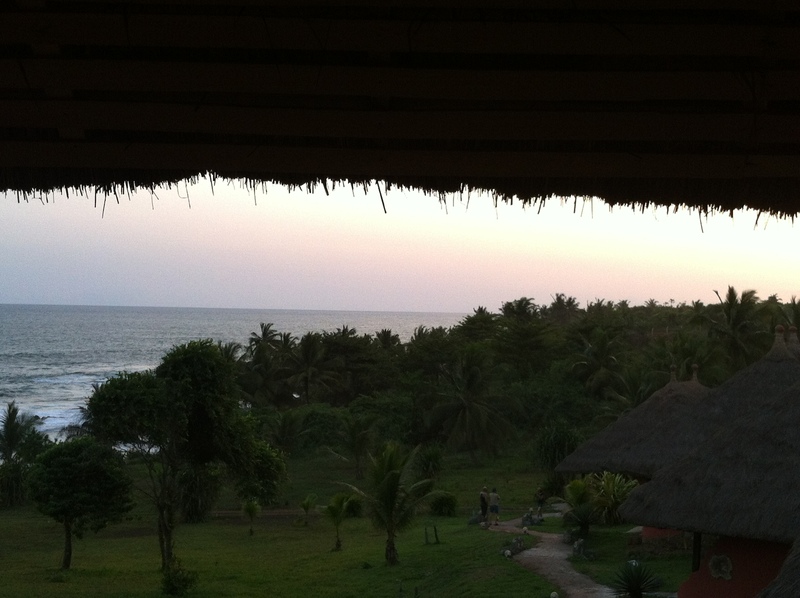 It really did change my opinion of Ghana, that it could be, in places, a tropical paradise. We spent many hours sitting and chatting and sharing cold beers. But, the many hours of sitting on the verandah, was largely waiting for food. 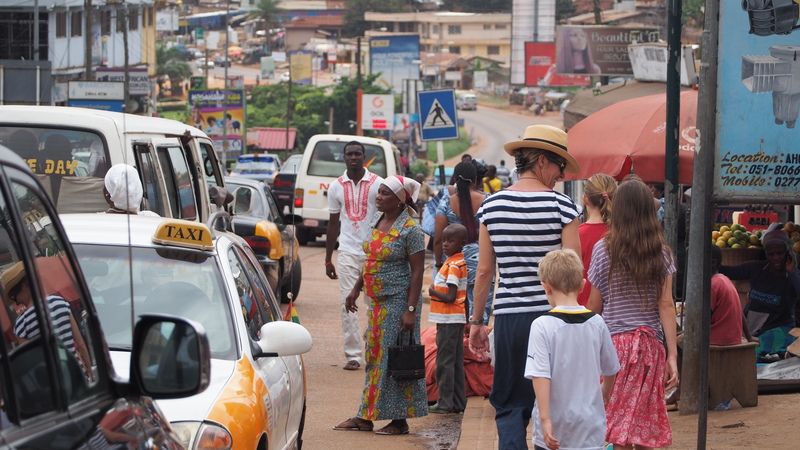 Customer service is notoriously bad in Ghana, and a 2-3 hour wait for a meal was, unfortunately, standard. We even tried to circumvent this, by ringing 2 hours ahead of when we were ready to eat. And yet, we still waited 2 hours after the designated time. With 7 kids in tow, the fun soon wears off. Advice from an experienced expat should never be ignored. So when my Italian friend told me she brought all her food from home when she travelled for a weekend; I thought that doesn’t sound like a weekend off from the kitchen to me, and so I just brought snack food. More the fool me. When we caught up with the said Italian friend a few days later at Elima; and ate her feast under the stars; I swore I would never rely on hotel food in Ghana again. 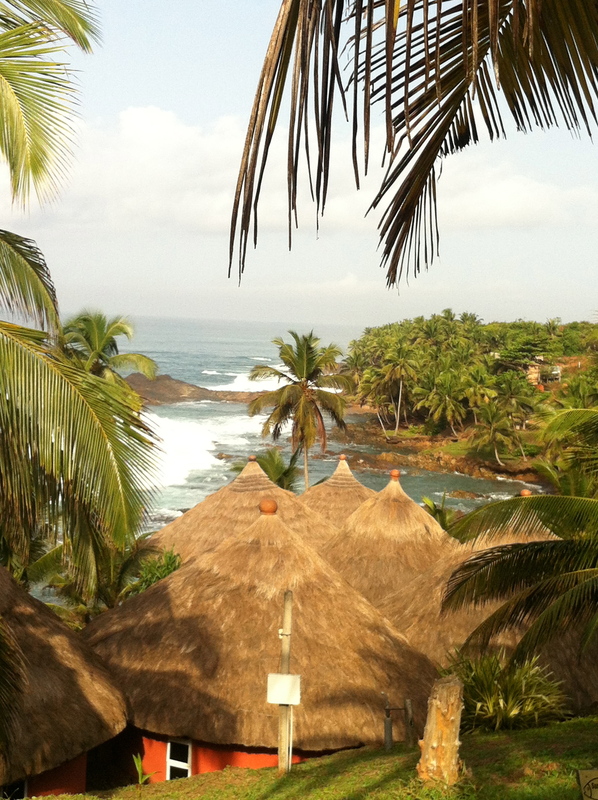 It is a real shame, as the hotel was picturesque, the beach was a salve to the urban jungle of Kumasi, the Easter weekend entertainment provided by a dance-drumming group from Côte D’Ivoire was exotic, and the company (because I know you are reading this!) was….ok. (hahahaha). Here is a fairly average video of the Ivoirean dance-drumming group. They were great: super energetic and who doesn’t love African drumming? 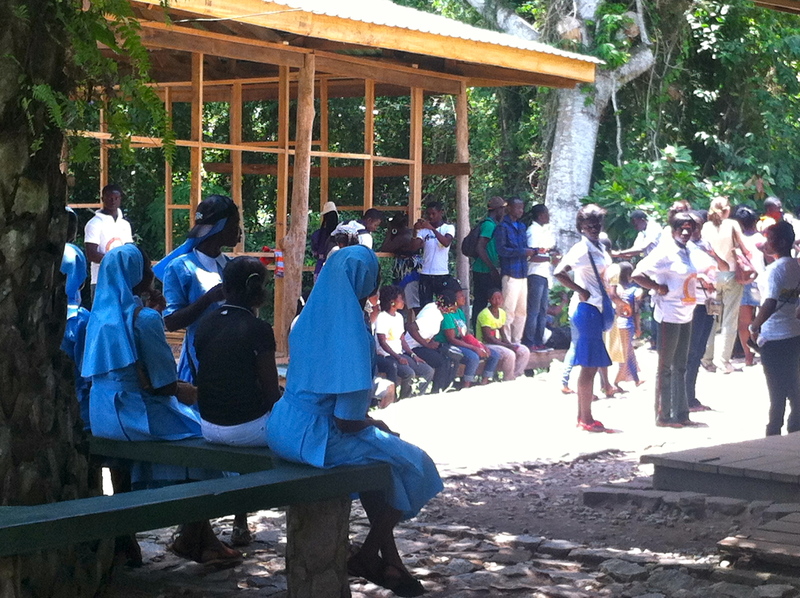 After a visit from the Easter Bunny on Sunday, we headed east to Elmina. 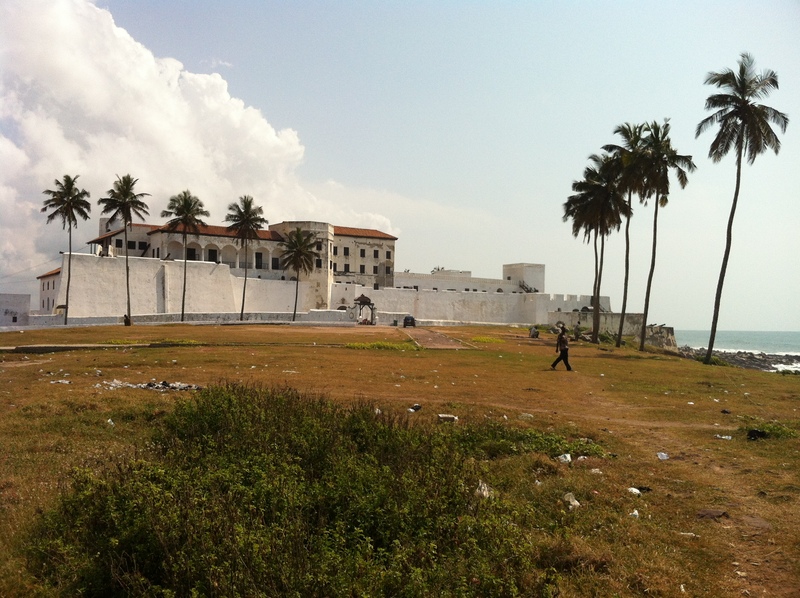 The plan was to break the return journey and to visit the Cape Coast Castle and Kakum Nature Reserve. 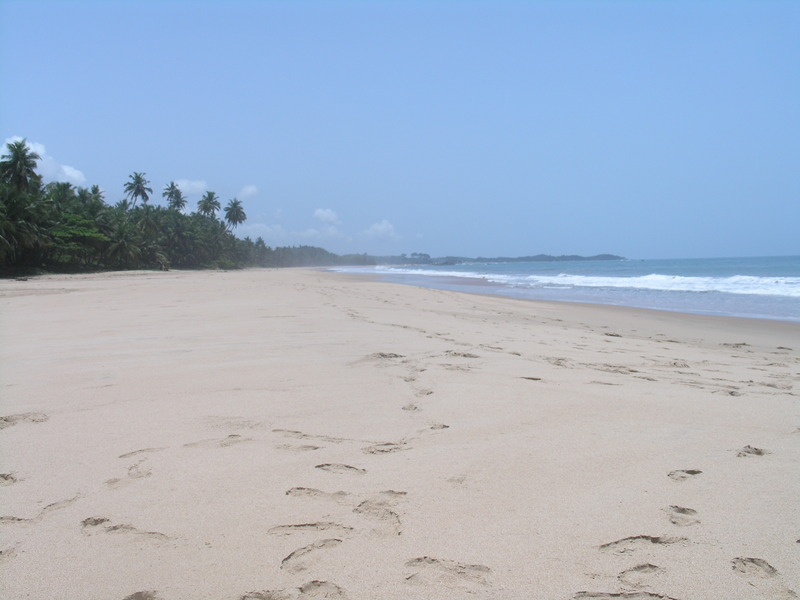 This stretch of coast, about 3 hours west of Accra; is named Cape Coast. 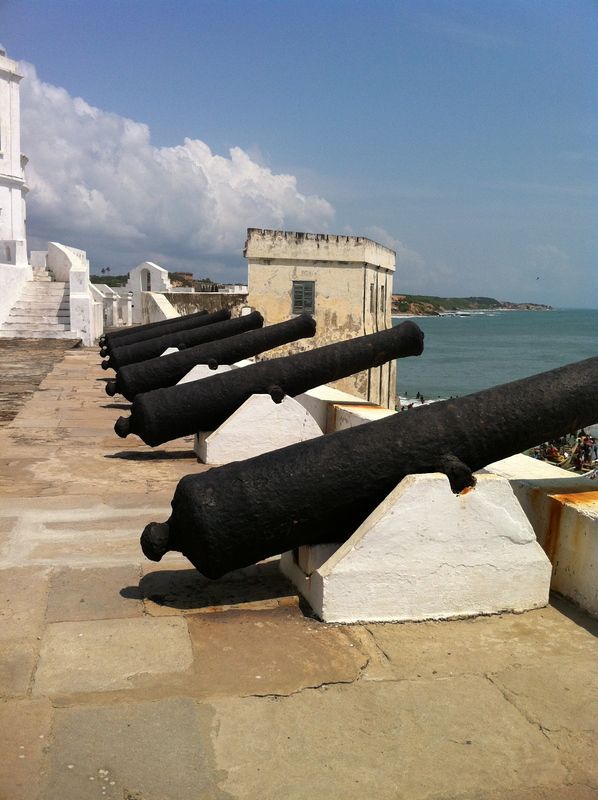 It houses some of the best preserved slave forts along the entire West African Coast. Imposing whitewashed structures, perched on cliffs along the coast; they have been occupied by the Portugeuse, the Dutch, the Danish and lastly the British. Started as forts for the export of gold, lumber and other products; their use by Europeans soon became the depraved trade in human beings. 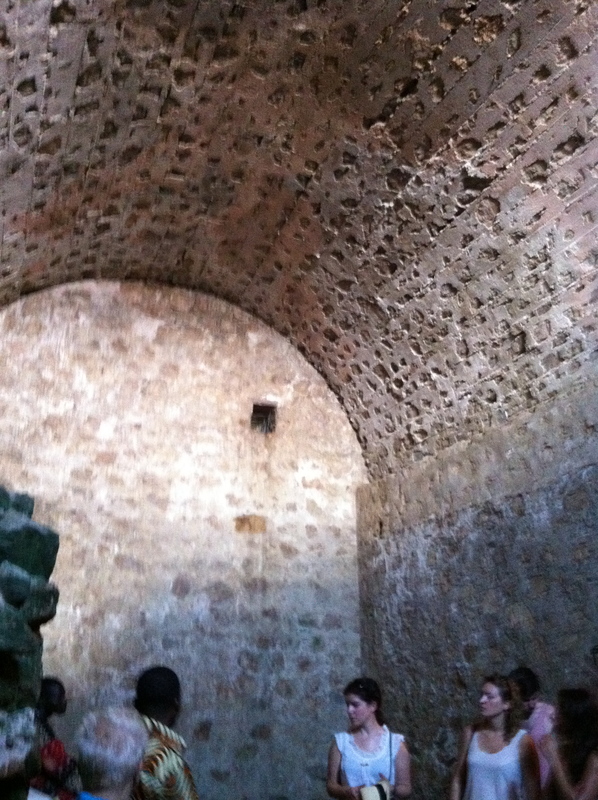 Up to 250 men were held in this room. 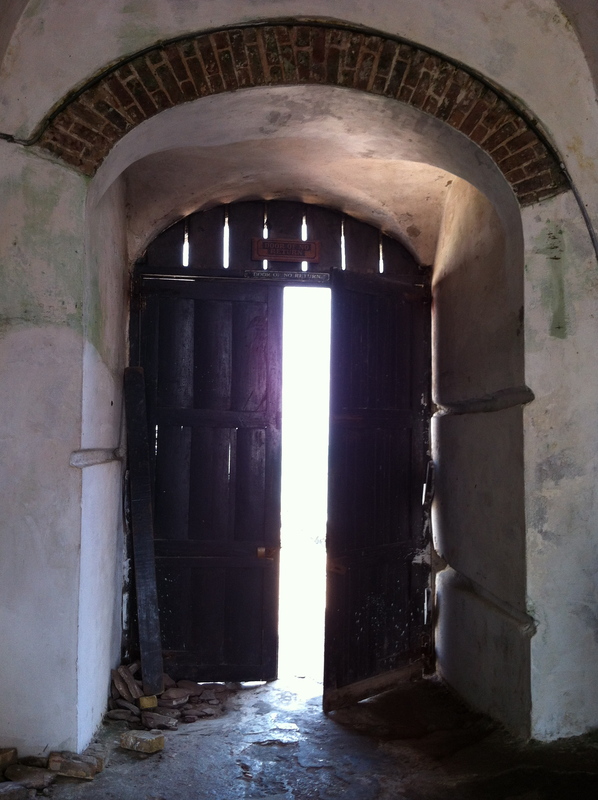 The infamous Door of No Return. The children were allowed on the tour with us, which despite the horrific nature of the events which took place there, we felt it important for them to have a sense of a defining part of West Africa’s history. It is impossible to understand how it all could have happened. We stayed at Coconut Grove Beach Resort, which is a total old school holiday destination, complete with Spanish Hacienda style architecture. It has a pool, golf course, petting zoo, horse rides on the beach and crocodile enclosure! True! Staying only one night there, and not availing ourselves of the restaurant, I can only say it would be a fun place to spend a few days, particularly if you are a golf nut, or have kids, or both! 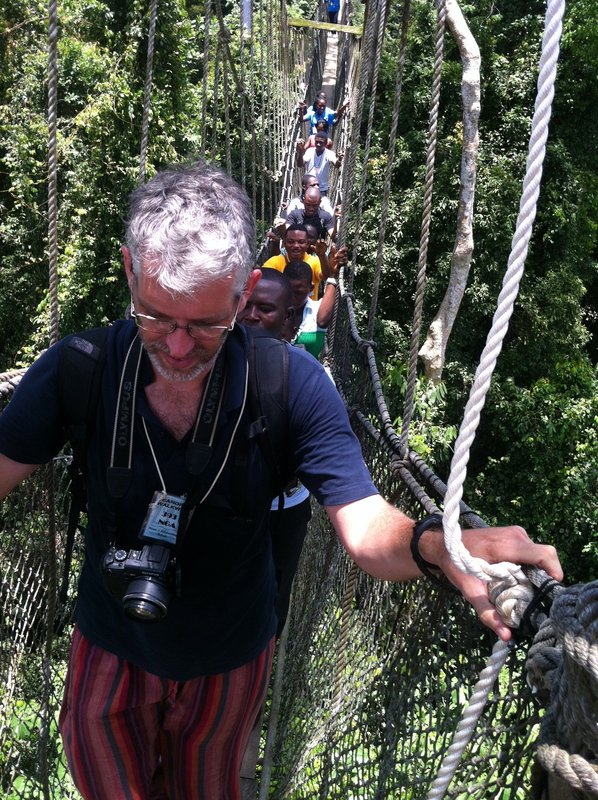 The next morning we headed to the busiest national park in Ghana; Kakum National Park. And I can see why it is so popular, it was great. Bushwalking anywhere in the ‘Christian’ world on Easter weekend, is bound to be busy, but I swear half of Ghana was there, and apart from us; it seemed everyone was on a Church ‘Fun Club’ weekend away. While it is possible to walk on the forest floor, the drawcard of the park is to walk on 7 suspended bridges through the canopy. 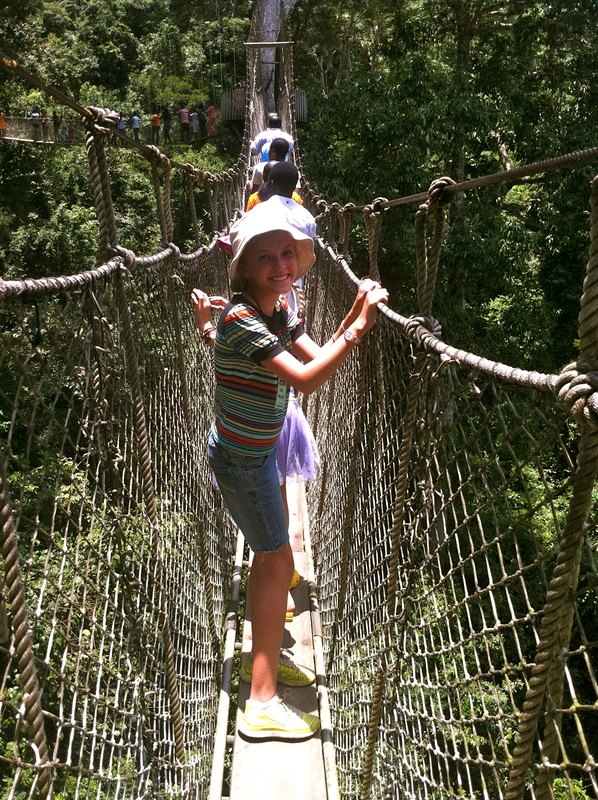 The bridges are narrow ladders, with planks laid over them, and held aloft by rope work netting. It’s high, it’s wobbly and quite freaky. The crowd, though massive, was good natured; and the shrieks and nervous giggles added to to atmosphere. Needless to say, with all that noise, not much wildlife was on show. But the vision of a shrieking nun in a blue habit walking across the bridges will stay with me forever. We all needed a good sit down after the excitement of the canopy walk. 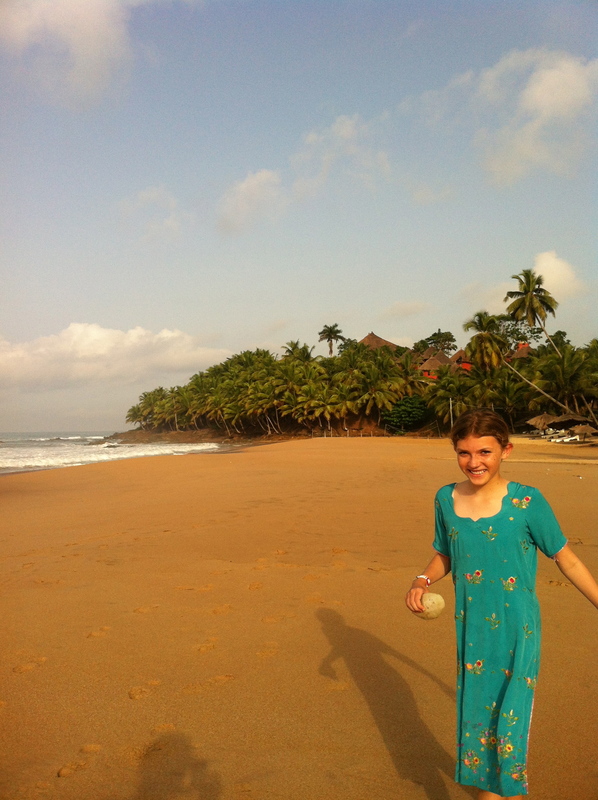 Ghana looks beautiful – I’ll have to plan a visit! Thanks for your comment Travis. 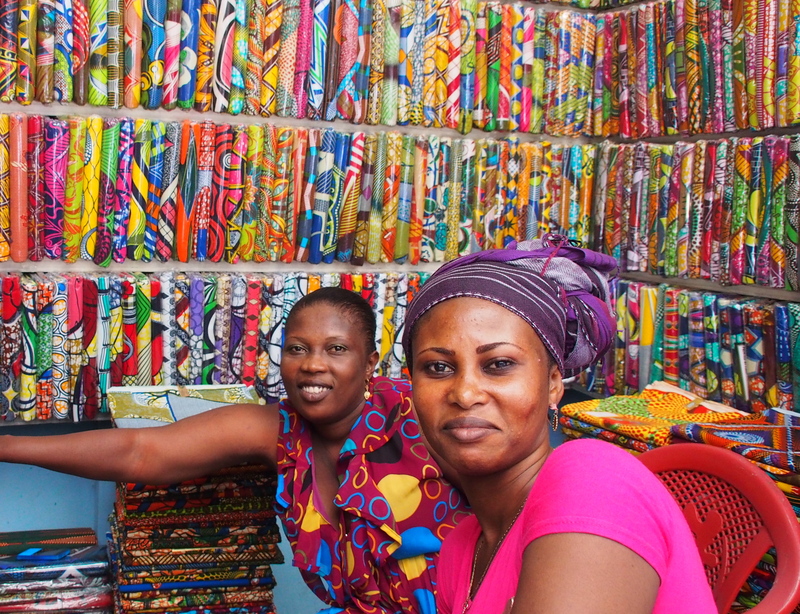 There is always plenty to see in Ghana! I’ll be sure to look at your blog. Yeah. It was pretty average. I think it’s really great that the fort is still preserved and used as an education tool today. I was always so curious about the history in our area while living in Gabon but it was quite difficult to find much recorded. Sounds like an interesting trip. I also learned to over prepare when travelling in Gabon but realized that no matter what, it’s impossible to plan for everything! I suppose if anything we get good at making good out of what we have!